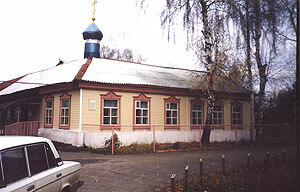 In 1920 a wooden building of the household court was constructed at the church of the Smolensk icon of the Mother of God. It was a living place for some monks. Candles were produced there, and a church farm was located within this building as well. After the church was blown up in 1948, it housed school and a club. After the building was passed to the diocese of Kazan in 1999, a parish community of the village found its lodging there. Necessary repair works were carried out in the house, after that, regularly divine services were resumed. Dean of the church is the priest Anatoly Togoulev. Divine services are held on Sundays and on holy Feast days: Liturgy at 8.00, All-night-vigil at 16.00.